Travis back and I have a great way to save some cash at the InterContinental Tampa Hotel. Football fans can show their spirit and save with the InterContinental Tampa’s winning football challenge fan rate. During Bucs home game weekends, rates begin at $109, but guests that select the winning team for that week when making their reservation will automatically save $20 off each night they stay. To book the fan rates, just call (866) 402-0758 and mention code ILSEK and the prediction for the winning team that week. Here&apos;s some info about the hotel - InterContinental Tampa is centrally located in the heart of Tampa Bay offering guests the most convenient access to world-class shopping, dining, entertainment, sports and the area’s most memorable attractions, including Raymond James Stadium – home of the Tampa Bay Buccaneers. The AAA Four Diamond InterContinental Tampa is the ultimate escape with a rooftop pool; a state-of-the-art fitness center; and outstanding on-site dining at the world-famous Shula’s Steak House. 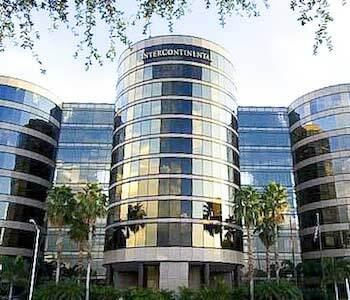 The InterContinental Tampa offers complimentary wireless high-speed internet in guestrooms and public areas of the hotel, as well as complimentary transportation to the nearby airport. Head over to www.intercontampa.com for more info. And keep checking back here for more updates, and info on other great things to do in Tampa Bay and Tampa Bay area events.